I knew exactly what I wanted to make for this week’s Project Run and Play sew along as soon as they announced the themes. I had never used Dana’s circle skirt tutorial before, but it seemed like my idea would work using it. 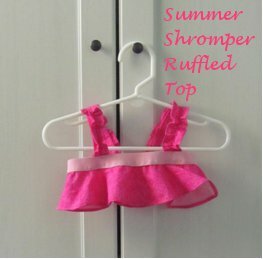 The resulting Summer Shromper with removable ruffle top was exactly what I was picturing. My style usually consists of simple lines and solid colors with accents of bright patterns here and there. 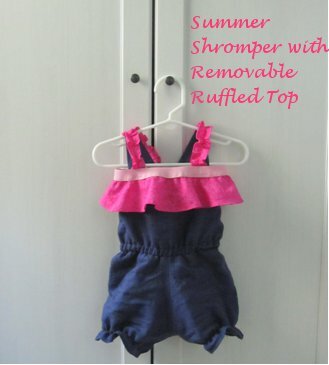 This jean colored shromper is perfect for that. It can be paired with any bright color and look great, but the shromper itself has clean lines and a simple shape. The front has a straight top while the back has an elastic encased to allow for growth and easy in and out for Bean. 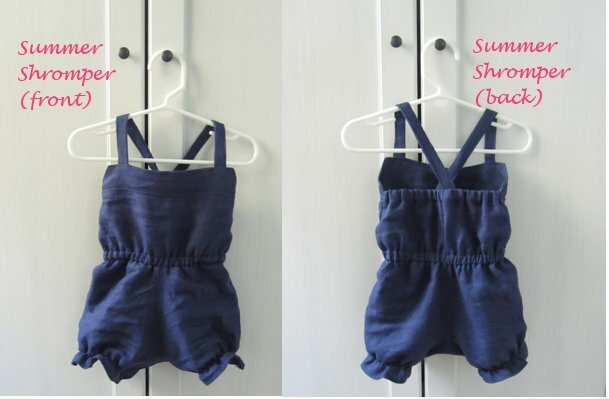 The straps have snaps in the back so they can be worn crisscrossed or straight as she grows. For now I twisted them and then snapped them to make sure the front didn’t slip down. There is also an elastic casing around the waist where the top and bottom were sewn together. This was also for ease of fit and getting a baby in and out, hehe. The legs each have a finished hem and then elastic to make them puff a bit. There is a snappy crotch so I can change Bean’s diaper without removing the whole shromper. I’m so happy with how the top came out. I plan to make more in other colors for mixing it up. Yellow is next in line (I’ve already dyed the elastic, hehe) but I can see it working in lots of fabrics. It was made using the circle skirt tutorial. I used Bean’s chest circumference for the inner circle and a width of about 3 inches. The elastic was dyed a pretty pink color too. I decided to add ruffled straps to make sure the top stays in place. 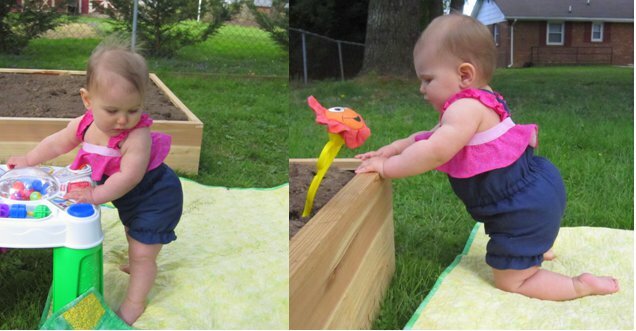 Bean does a lot of twisting and turning these days and I didn’t want to turn around and find it around her knees, hehe. So far everything seems to stay in place. I made the shromper pattern from scratch during Bean’s nap so I didn’t have her around for measurements. Luckily the fit turned out well. The circle skirt top is really cute when it blows in the breeze. Let me know if you’re interested and I’ll post how I made the shromper. I think we’ll get a lot of use out of the Summer Shromper this year. Especially with the weather we’ve been having. We’re due for 80s this weekend. Bring on the summer! I really like the color on the top. It really makes it cute and brightens up the whole thing.